Phase I: Discovery: We begin this stage during our initial meeting where we get to know one another. Our advisors focus on what your specific needs are and what you want your capital to do for you. Phase II: Strategy: The primary objective of this stage is to develop an effective, long-term strategy that is custom tailored to the unique needs of each client. We then develop a comprehensive plan that outlines the strategy we recommend for long-term success. 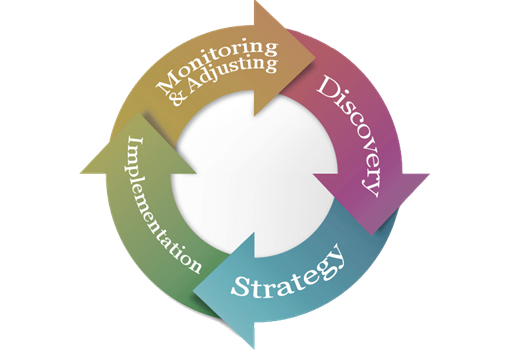 Phase III: Implementation: The primary objective of this phase is to successfully implement your strategy. By means of constant communication and a highly skilled staff, we strive to make this process quick and easy for you. Phase IV: Monitoring and Adjusting: We monitor our client’s accounts on a regular basis to help ensure they are still performing in a way that meets their intention. When we discover that a client’s circumstances have changed, or that shifting global markets require a different approach, we are quick to recommend any adjustments.